Given the strong Roman Catholic faith of the Portuguese people, it is hardly surprising that most of the festivities in the Azores are associated with religious holidays or Saintâ€™s Days.Â A few of the festivities are unique to one of the Azorean Islands, but most are celebrated throughout the Islands with only minor differences in techniques and forms. The most common festa is the Holy Ghost Festival or Festa do Divino Espirito Santo. This festival celebrates the third person of the Godhead and is a day for some lucky poor person to be named Empress or Emperor for a day. The royalty is crowned and escorted through the streets to the local church where a Mass is said.Â The celebrants then move to the local fellowship hall where a special meal of â€˜Holy Ghost Soupâ€™ and sweet bread known as Pao Doce is served.Â The feast is followed by dancing and general merriment.Â These festivities are generally held seven weeks following Easter. The largest religious festival in the Azores is the â€œFesta do Senhor Santo Cristo dos Milagresâ€�, (meaning the Festival of the Christ of Miracles). 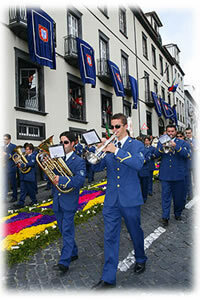 This festival takes place on the 5th Sunday after Easter, in the city of Ponta Delgada. A statue of the Christ is paraded through the city, and then returned to the convent at EsperanÃ§a.Â In addition to the religious aspects of the festivities, there are street booths, a fair, and general merrymaking. 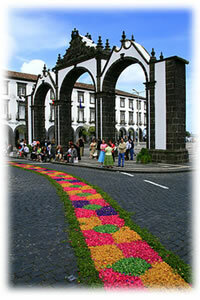 The MarÃ© do Agosto Festival on Santa Maria, is one of the most famous festivities in the Azores. Many cultural activities, among which are concerts, take place on the small Praia Formosa. This festa is normally visited by well-known names from the national and international music world, attracting thousands of youngsters that during the days of August 23rd and August 26th, vibrate with joy and vivacity. The largest festival in Santa Maria, with traditional and religious characteristics, takes place at Vila do Porto on August 15th in honor of it's patron saint, Our Lady of Assention. The festivals of Saint John is better known by the people of Terceiras as Sanjoaninas.This group of festival days occurs between June 21 and June 30 and is meant to honor the patron saint of the island of Terceira, Saint John. The festivities are based in the city of Angra do Heroisimo.Â Each day, triumphant marches, decorated cars, and parades rich in folklore and ethnic emphasis portray the joy and enthusiasm for living that is held by the people of the Azores. The DanÃ§as de Carnival are groups of people who perform in comedy and dance routines at the thirty theatres on the island.Â Almost the entire population of the island fills the seating. The Cultural Week of Velas is the most popular event on the island of Sao Jorge. This celebration takes place during the first week of July annually.Â Conferences and speeches from people who are well known in SÃ£o Jorge and in the Azores in general go on during the entire week.Â There are concerts both by local artists and artists from the mainland.Â There is a bullfight festival and the Horta â€“ Velas â€“ Horta Regata which attracts dozens of boats. In addition to these and other festivities which may be specific to one or more various islands, there are the usual religious and political holidays such as New Years Day, Easter, Christmas Day, National Day of Portugal, and Autonomy Day. On Pico the festivals of SÃ£o Roque do Pico take place in the last week of the month of June with musical concerts, cultural activities and exhibitions. These festivities attract thousands from Portugal and other parts of the world, during the last week of June. There are many musical concerts, exhibitions and other cultural activities. The week of the Sea is held each year on Faial during August.Â Many sea-related festivities take place, and thousands of visitors from the Portuguese mainland arrive to take part in the musical and cultural activities. During Sea Week musicians from other islands and from mainland Portugal attend to participate in cultural events, pageants and other celebratory performances of the ethnic background and history of the people. With a duration of two days with the start on the first Sunday in August, we have the Santa Cruz festival on Flores. During this festival there are many arches with flowers, decorating the streets and creating a marvellous atmosphere of colour and happiness. With the presence of crowns from the 27 Holy Ghost shrines in the island, it is considered the largest festival in the Azores in honor of the Holy Ghost. The Folares Festival on Easter and Â the processions of Our Lord of the Paces, on Good Friday, are done with great enthusiasm by all parishes. It is joined with the Sanjoaninas Festival, in Santa Cruz, that attracts many outsiders and immigrants from other islands, but also form other parts of the world. The Lady of Flores Festival, which takes place in the Matos Chapel, is the most participated of all the island. Finally we have the Emigrant Festival in Lajes das Flores, which takes place on the second weekend of June. Festa Sr Santa Cristo dos Milagres -- held the fifth Sunday after Easter Sunday in Ponta Delgada. Festa de S. Joao da Vila -- held June 23 in Vila Franca. Cavalhadas de S. Pedro -- held June 28 in Riberia Grande. Semana do Chicharro -- held the middle of July in Ribeira Quente. Sao Joaninas -- held during the third week of June, this festival features a number of processions. Tourada a Corda (running of the bulls) -- the tourada season lasts from May 1 to September 30, and occurs on a daily basis during the season. Festas de Praia de Vitoria -- this festival is held during the second week of August, with one of the highlights being a food fair. Angrajazz -- held during the first weekend of October, Angrajazz is a jazz festival held in Angra do Heroismo. Ramo Grande Festival -- held in late October and early November, this festival features world music performances. Cultural week -- held during the first week of July in Velas. July Festival -- this music festival is held during the last week of July in Calheta. Cais de Agosto -- depending on the calendar, this music festival is held the last weekend of July or the first weekend of August in S. Roque. Festa do Senhor Bom Jesus Milagroso -- held the first week of August in Sao Mateus. Semana dos Baleeiros -- this religious and music festival is held the last week of August in Lajes. Semana do Mar (Sea Week) -- held every year in August. This event includes a number of sea-related activities, including water sports and cultural events. Espirito Santa -- held seven weeks after Easter. Festa de Santa Cristo -- held in early August, this event features boat races, bullfights, and other events. Festa de S. Joao -- held the last week of June in Santa Cruz. Festa do Emigrante -- this culture and music festival is held in the middle of July in Lajes. Festas N. Sra. da Assuncao -- held August 15 in Vila do Porto. Festas Mare de Agosto -- this music festival is held the third week of August in Praia Formosa.